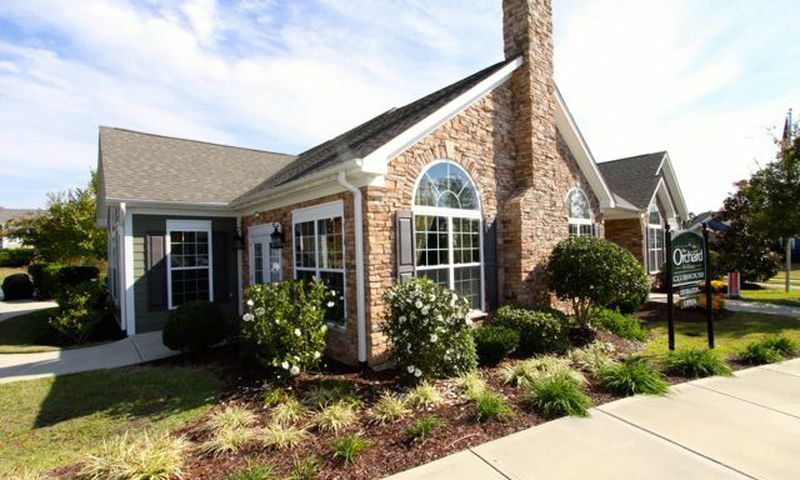 The Orchard Villas in Apex, North Carolina is an active lifestyle community near Raleigh. With 86 homes, The Orchard Villas provides a quiet setting for homebuyers who want maintenance-free, ranch home living. Cornerstone Homes began construction of The Orchard Villas in 2008. Homebuyers can select from resale homes that meets all of their requirements for the perfect home. The 3,000 square-foot clubhouse provides a great place for residents to gather, mingle, and relax. The Orchard Villas’ amenities include an outdoor heated pool, exercise room, bocce ball court, putting green, and card table. There are a variety of activities within the community. Some popular activities include weekly coffee hour, yoga class, and more. Residents can form clubs based on common interests and hobbies and gather in the clubhouse for meetings. Homebuyers can choose from single-level, attached floor plans that range in size from 1,547 to 2,335 square feet in size. Situated in quads, these homes offer one to three bedrooms, two to three bathrooms, and an attached garage. These attached homes were uniquely designed to give each home a single-family look and feel. In addition, a great selection of included features provides each home a distinguished eloquence. The Orchard Villas is located in Apex, North Carolina. Known as the “Peak City,” Apex is one of the fastest growing areas in Wake County. With a small town feel and big town amenities, Apex is one of the Triangle’s most popular destinations. It is noted for its scenery and the quaint historic downtown district. The Orchard Villas enjoys easy access to the Raleigh-Durham International Airport and Raleigh, Durham, and Care a short drive away. Nearby amenities include Jordan Lake, a local library, shopping, restaurants, and healthcare providers and many other services. With low-maintenance homes, friendly neighbors, and a convenient location its easy to see why The Orchard Villas is a wonderful community. Clubhouse - 3,000 Sq. Ft. There are plenty of activities available in The Orchard Villas. Here is a sample of some of the clubs, activities and classes offered here. The Orchard Villas now contains 86 low-maintenance attached homes. Homebuyers can select a floor plan that ranges from 1,547 to 2,335 square feet in size. With one to three bedrooms, two to three bathrooms, and an attached garage there are many unique options. The community of Orchard Villas is what drew us to move here. Neighbors are caring and friendly reminescent of a time past. The variety in floor plans was another reason for us to choose this community. Numerous community events each month allow for everyone to get together and share an evening of fun and laughter. The community pool is a great place to gather on a hot day for a cooling dip. All in all, this is a great place to live. 55places.com is not affiliated with the developer(s) or homeowners association of The Orchard Villas. The information you submit is distributed to a 55places.com Partner Agent, who is a licensed real estate agent. The information regarding The Orchard Villas has not been verified or approved by the developer or homeowners association. Please verify all information prior to purchasing. 55places.com is not responsible for any errors regarding the information displayed on this website.